Astonishingly, every single tow we did within the North Pacific Gyre contained plastic. Plastic was found not only floating at the surface, but mixed by wind and wave down to depths of 30 feet. We now know that surface tows do not give us a complete picture of what is out there. Just how much did we find? From out neuston, manta and MOCNESS tows we counted 66,077 pieces of plastic. From visual surveys we counted 2796 pieces of plastic. In total that’s 68,873 plastic pieces! It’s hard to imagine what this number actually looks like out in the ocean. Let me tell you that is a LOT of plastic, and 95% of it is smaller than your pinky nail. That means there is no floating island of trash out there, and it is certainly not visible from space as some internet searches might lead you to believe. 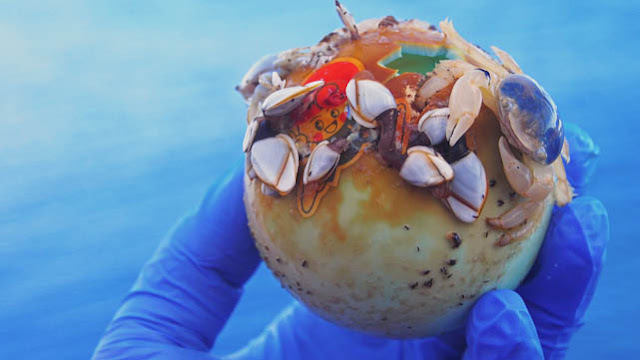 In reality, the Giant Pacific Garbage Patch is a large area of plastic soup, seasoned liberally with tiny floating plastic bits and the occational larger dumpling, like a buoy or a capped bottle. Why is this plastic so small? Just like we get a sunburn if we stay in the sun too long with no sunscreen, plastic gets sun damage, causing it to photodegrade, or break into smaller pieces. As plastic gets smaller, it becomes ingestible on every level of the food web, from zooplankton to albatross to whales and yes, even to us. These plastic bits are known to leach and concentrate toxins. If these toxins accumulate in our food, they accumulate in us. Medical professionals are beginning to question whether the abundance of chemicals in the environment could be linked to rising occurances of diabetes, obeisity, autism and ADHD. Even though these plastic pieces are in one of the most remote places on the planet, they could be affecting our health. In my next post, I'll talk about some of those larger items of trash that we spotted—some could even have come from the Japanese tsunami. Stick around. 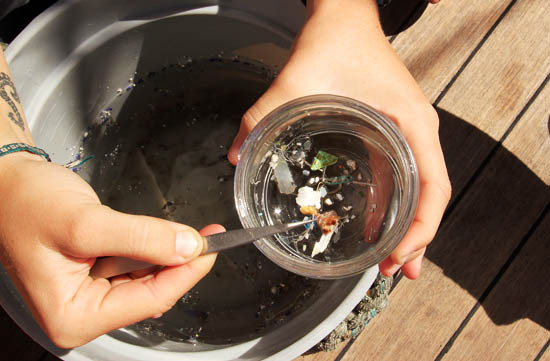 Learn more about Kim's expedition to study Plastics in the Pacific. How do you study plastics in the ocean? Why is there plastic in the ocean?